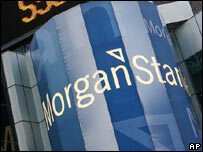 Morgan Stanley has revealed it has suffered a $3.7bn (£1.76bn) loss from its US sub-prime mortgage exposure. It also said the loss may reduce fourth quarter earnings by about $2.5bn. The US investment bank said the loss happened in September and October, and that the figure may change before its financial quarter ends this month. It comes after the firm said in September that it had written down $940m of losses caused by problems in trading mortgages and corporate loans. It attributed the new loss to the deterioration in capital markets, a state of affairs which has been triggered by thousands of US homeowners failing to keep up with their mortgage payments. There is great interest in how hard the big American banks have been hit by the sub-prime mortgage crisis. The sub-prime crisis was caused by record levels of defaults by people with poor credit histories or low incomes who had been lent money to buy houses. The amount of debt of questionable value in the market has caused problems for banks that specialise in buying and selling debt. A number of US financial firms, including Citigroup, Merrill Lynch, and Bear Stearns have all reported problems from exposures to lower-quality debt. "Morgan Stanley can take the hit," said Sean Egan, managing director of Egan-Jones Ratings credit rating agency in Philadelphia. "Of all the players we worry about, Morgan Stanley is nowhere near the top of the list." The bank said it had reduced its net exposure to sub-prime debt - the potential loss if all of the debt's value were wiped out - to $6bn by 31 October, from $10.4bn on 31 August.